At the Green Party’s Autumn Conference this past weekend, I stood up and spoke, for the first time, to a mass of assembled party members. 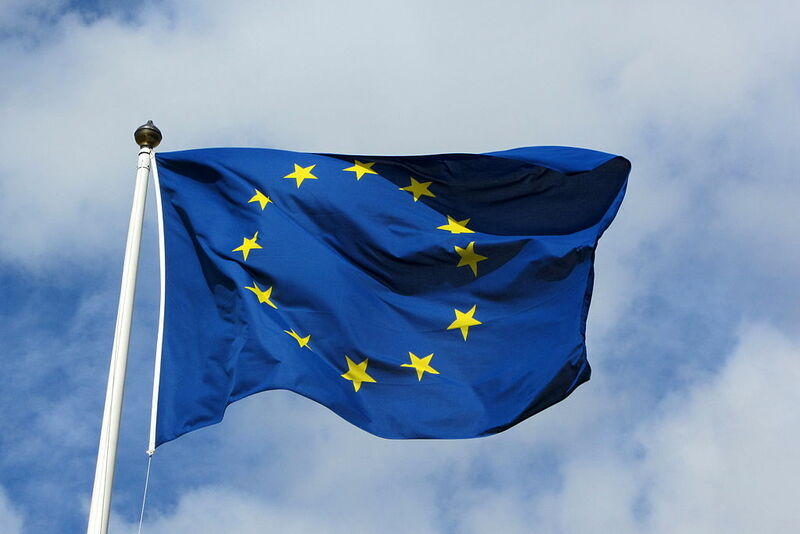 I was proposing an emergency motion on the Green Party’s role in the forthcoming EU referendum debate – a motion to instruct the party to use our distinctive voice on the issue to campaign for the UK to remain in Europe. 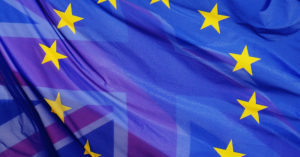 In recent months, it hasn’t only been UKIP and others on the right pushing for a Brexit, but some on the left too: we’ve witnessed the appalling treatment of Greece by the Eurozone and the attempts to rush through the dangerous and anti-democratic Transatlantic Trade and Investment Partnership, and understandably many are growing concerned that the EU isn’t the kind of institution we want to be part of. However, the EU itself is not the problem. It’s governments like our own, represented in the European Council and Commission, pushing Europe in its current pro-austerity and pro-free market direction. Our own government is strongly in favour of TTIP, and has signed similarly damaging trade deals outside of the EU; our government, too, has been fighting for the UK to be exempt from vital workers’ rights legislation. Meanwhile, left-wing movements are growing across Europe, from Syriza and Podemos to Green Parties across the continent – challenging the prevailing centre-right policies of the current EU establishment. Our place is in that movement, not outside it. 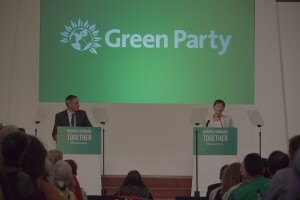 I believe that the Green Party has something unique to bring to the forthcoming debate. Unlike other pro-EU parties, we won’t focus on the advantages for big businesses, or the benefits for trade, of remaining in the EU. Instead we’ll be talking about the importance of shared solutions to climate change, the refugee crisis, and other cross-border challenges we face. And we’ll be talking, too, about the kind of Europe we’d like to see: more powers for the democratically elected Parliament (and less for the unelected council and commission); a greater commitment to decentralisation and local decision making; and stronger action against the dominance of powerful corporations. But it’s vital that it’s not just people at the top of the Green Party making this case. While it’s Green MEPs who fight for a better EU in Brussels, it’s activists like me who will be getting that message out to members of the public every day in the upcoming campaign. For that to happen, it’s absolutely fundamental that the membership of the party is 100% behind the campaign. And it seems that that is the case: my emergency motion passed with only a few votes against. This marks the beginning of what I’m sure will be a fantastic, energetic campaign – and I can’t wait to get started on fighting for the Europe of solidarity, democracy and integrity which I – and so many others – desperately want to be a part of. Sad to say that I will be resigning my membership of the Green party. The EU is toxic to environment, wildlife, conservation and democracy. It has destroyed ecosystems continent-wide. The Green party has lost sight of its roots and reason for being. It disgusts me that this political party refuses to countenance the widespread damage caused by the EU and its activities. Rather than making vapid arguments, the Green Party should be working with other groups to make sure habitats are protected and conservation schemes remain for farmers when the UK exits from the EU. Why has this party become so blinkered? My resignation is in the post. Re: “it’s absolutely fundamental that the membership of the party is 100% behind the campaign”. Its absolutely fundamental that members of any party democratically make up their own minds what they support. 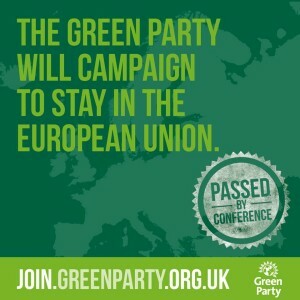 There are members among the so called ‘green’ party that support the separation of countries within the United Kingdom and yet also support a continuation of membership of the European Union. Just saying. How many people voted Georgia? Something as important as this needs to be debated by the whole party. I was at conference and missed this because it wasn’t on the agenda. I don’t regard it is an emergency when we don’t even know what Cameron’s deal will be yet. I appreciate having a debate, but it’s too early to try to finish it now. I certainly don’t feel bound to campaign for a yes vote because a tiny proportion of Green members voted for it in an “emergency” session with virtually no notice. There seemed to be a concerted effort to get people on the “yes” side at conference. All delegates had a “green yes” leaflet inserted into their welcome pack, as though it was already a fact that we were campaigning for a yes. It’s all leaving a rather nasty taste in my mouth. youre not compelled to vote for a yes vote by this decision robert – parties cant ‘compel’ their members to vote in a particular way in a referendum. Out of interest would you have reacted in the same way if the conference had sided with ukip and voted to campaign for a no vote? Silly reason for Pro EU stance. The unelected commitian appears to be corrupt so, no matter what they do, we will stay their victims. We will however say more words about the powers of the unelected commission. An issue that NO one..no matter how ‘vocal’ they have been condemning the situation has managed to table a bill on. Just think on that for a moment. Almost ALL candidates from ALL parties have been condemning the structure for ten years…and a bill has nor been tabled? There is only one answer to this. Cronies stand in all parties under all banners. The establishment thrives on layers of beuracracy and secrecy. Since, at present, voters and party supporters are too lazy or conflict adverse to vet their own candidates..and 99.99% of us too humble or cheap to stand..there is NO WAY that another layer of complicated beuracracy will not scupper equality. We have the UN for climate change. TThat’s plenty because there’s NOTHING we can do about that without the world taking part.